Don’t be fooled by the Steel Panther-style album cover/title, Eat Me is the best effort from The Last Vegas yet. These Chicago rockers have been grinding on the road and in the studio for over ten years with a throwback sleazy hard rock style. The band describes this new effort as “pop trash” but there’s no real change in the band’s style. If anything, they sound a bit more old school rock (that tends to happen when you bring in a Moog and talk-boxes). I do believe the band has matured as songwriters though. This album was apparently written and recorded in a very short amount of time, about 3 weeks, nothing feels rushed. The band continues to grow as songwriters. While I was a fan of Whatever Gets You Off, the next couple of albums didn’t grab me. Eat Me is different. Stylistically, not much has changed other than I just think the songs are stronger and catchier this time around. The only song that somewhat sticks out as different is the final track, “From Hell”, which seems to almost take an industrial twist on sleaze rock. I like it, though. The band delivers some solid ballads here as well (“Universe & You”, “Love’s Got Nothing On Me”). What absolutely takes the cake for me is “Hot Fudge”. Just a fun dirty, sleazy rocker and the band is obviously having fun on that track. Fans of Motley Crue, Buckcherry, Tesla, and Guns N’ Roses owe it to themselves to check this album out. 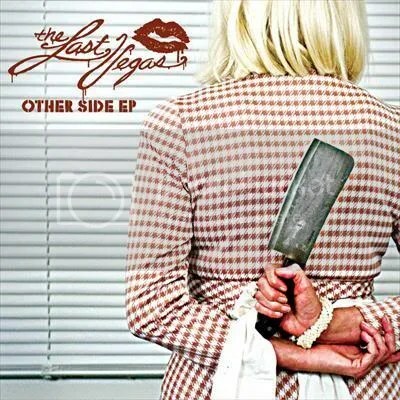 The Last Vegas – The Other Side E.P. 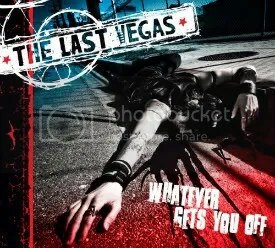 In preparation for The Other Side, a full-length album coming in early 2012, The Last Vegas have released The Other Side E.P., which is free to download from thelastvegas.com. If you’re familiar with The Last Vegas and like them then this E.P. is for you. All three songs still have that garage meets glam meets sleaze sound The Last Vegas have always had. There’s nothing here with the urgency of “I’m Bad” (“Other Side” is the single) but I like all three songs so I’m positive once The Other Side LP is released it will be another solid album from these Chicago rockers. I’m still waiting for a Last Vegas album to really knock my socks off but in the meantime their albums have been FUN and that’s what really counts, right? I’ll bet they’re a great live band. For those of you that want/need a little something more than just 3 MP3 files, you can head on over to CMDistro.com and order yourself the E.P. bundle which includes: the E.P. on CD, a t-shirt & poster all for $20. Cool deal and it’s pretty cool of the band to put out this EP for free in digital format too. Hopefully it’ll build a buzz for the band before the proper album comes out because they really are a good band and deserve the recognition. Unfortunately, it appears the guys are no longer on the Eleven Seven label (home of Motley Crue, Sixx:AM, Buckcherry and Papa Roach). Which is sad because I was hoping label president Nikki Sixx would continue to flex his muscles to get these guys on some good tours and it’s to my understanding that the “I’m Bad” single did very well on iTunes. I think Eleven Seven dropped the ball on this one. At least they have a successful producer working with them on this new album. Johnny K most recently produced Megadeth’s Thirteen but has also produced for Disturbed, Staind, 3 Doors Down, Black Tide, Sevendust and Bad City’s excellent Welcome to the Wasteland. So there ya go. New music from The Last Vegas — check it out for free or spend $20 to get some cool merch as well. One of rock’s most promising young bands is back again with their second release in just as many years, this time with major label support from Eleven Seven Music (the home of Motley Crue, Buckcherry, Drowning Pool, SIXX:AM, Trapt, Charm City Devils). I’m slightly disappointed by the track listing though. 6 of the 11 songs on this album are from their 2008 self-released and self-titled album. “Love Me Bad” is a reworking of “Love Me (When I’m Bad)” from last year’s album and “Whatever Gets You Off”, “I’m Bad”, “Apologize”, “Cherry Red” and “Dirty Things You Do” are the only brand new songs. I wasn’t even sure if I wanted to bother buying this CD, because of that fact, but the album can be found for around $7-9, so it was worth the risk to just to hear the new songs and also to own “I’m Bad”, which is my favorite song from them. Though it’s not an uncommon practice to see bands re-release or re-record their indie material for their major label debut, it’s still a bit of a letdown for listeners who were already following the band. With that gripe out of the way, let’s focus on the new songs (which Nikki Sixx, DJ Ashba and/or Marti Fredrikson had a hand in writing), which are all good and fit right in with the older songs. The funny thing is, most of my favorite songs from last year’s release, didn’t even make it this album, so in my opinion, the would’ve been even stronger if they were included. As it is, the album is full of solid garage/glam hard rock but the new songs are best on the album (except for “Cherry Red”, which kinda fell flat for me) with “Whatever Gets You Off”, “I’m Bad” and “Dirty Things You Do” getting constant spins from me. I had heard a really cool song on one of the local rock stations that had a strong 80s hair metal vibe. After listening to a few of the lyrics and going a Google search, I came up with nothing. So, eventually I figured out which station it was I had been listening to and hit up there play list and found out the song was The Last Vegas’ “I’m Bad”. I knew I had to check out this album, as was actually surprised when I went to their site to find out this 2008 self-titled release is actually their 2nd full album. Anyway, a sign of the times, “I’m Bad” is available exclusively as an iTunes download… it’s not on this album! Just seems really odd to me to have an album and a single out, yet, the single isn’t on the album. But upon closer inspection, seems like this album was self-released and “I’m Bad” is a single released under Eleven Seven Music (the home of Motley Crue, Buckcherry, Trapt, SIXX:AM). Well that gives me hope. I’d love to see Eleven Seven Music President Nikki Sixx help with the writing/producing of their next album (not that they really need the help). A quick check reveals a new album will supposedly come out Spring 2009. This release is being push more as a digital release, but I picked up the “limited pressing” digipak. I much prefer having a physical copy of music over a digital copy. So, despite my disappointment over not getting “I’m Bad”, I still really wanted to check out the band and they’re very good. How good? Good enough to score the opening slot for Motley Crue’s Saints of Los Angeles 2009 tour ! See how it all ties in together? No songs jump out as “hair band-ish” as “I’m Bad”, but it’s all still a good mix of glam, sleaze and garage rock. Even a bit of southern rock and punk seeps in from this Chicago-based group. The album has a very rough feel and it’s a nice refreshing take from some of the slicker rock acts out there. It’s good time rock ‘n’ roll with a very loose “who cares” feel.